I am so excited about teaching Kindergarten this year. Today was the start of my home visits. Over the next couple weeks, I will pay a visit to each of my 16 precious students. I just went to see one little guy, today, but the bulk of the visits will happen next week. The visit lasted about 45 minutes and we did some basic things like counting, naming colours, identifying a few numbers and letters. I had him write his name, tell me a bit about his summer and a little bit about himself (family, how old he is, favourite colour, etc). He was most engrossed in the picture he was drawing for me while I talked to him and asked him questions. Before I left, I took a photo of him to use in a classroom book (I'll take photos of all the kids as I visit them) and had him write his name on a piece of cardstock. The last thing we did before I said goodbye was to fill in a "Countdown to Kindergarten" calendar. Every day until September 10th, when I see him again, he will cross one day off the calendar. I gave his mom a package of things to read before school starts in a couple weeks. One of the things I included is actually something that I received from my kids' teacher when they were in Kindergarten. My kids are now heading into grades 2, 4 and 5. 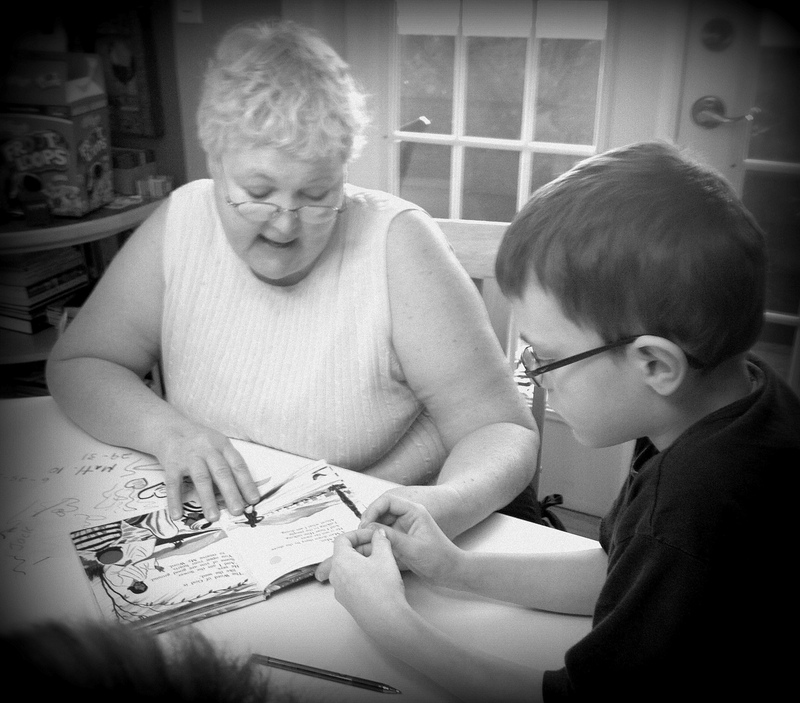 * Photo of my mom reading to my son. teaching them a Sunday School lesson.